Frontispiece from Price's autobiography Search for Truth - My Life for Psychical Research (Collins, 1942) with printed signature. 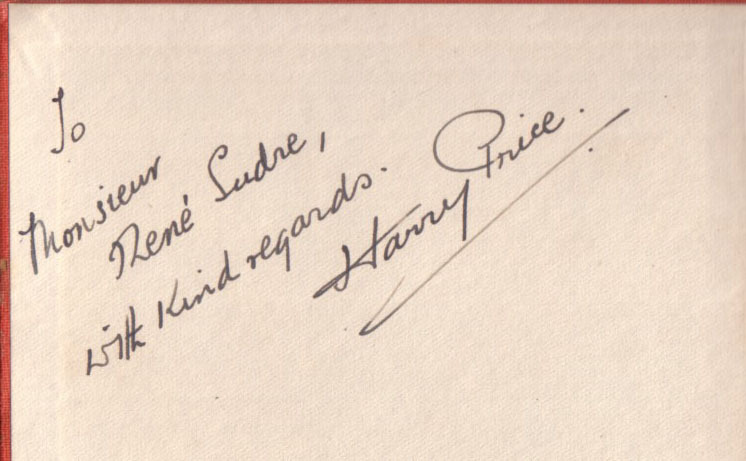 During the course of his career, Harry Price wrote numerous articles and several books, and as such many were signed & inscribed to friends & colleagues. This page contains scans of several of his major books which were dedicated to his contemporaries in the fields of magic and scientific psychical research. It is hoped to update this page with further entries in due course. The works are listed in chronological order. 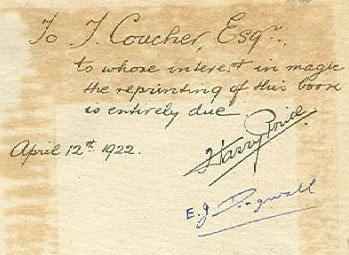 Copy of the reissue of Revelations of a Spirit Medium (Kegan Paul, 1922) with a dedication to fellow magician J. Coucher by both Price and his collaborator Eric J. Dingwall (Dated 12th April 1922). 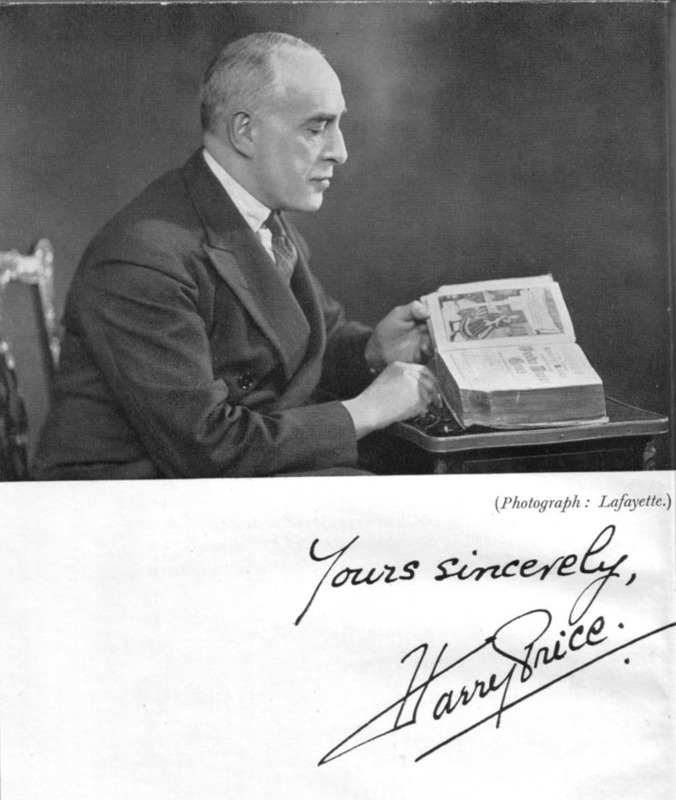 Copy of Price's Cold Light on Spiritualistic Phenomena (Kegan Paul, 1922), the exposure of spirit photographer William Hope, dedicated to fellow psychical researcher René Sudre (Undated). Copy of the reissue of Revelations of a Spirit Medium (Kegan Paul, 1922) dedicated to fellow psychical researcher René Sudre (Undated). Copy of Price's Stella C - An Account of Some Original Experiments in Psychical Research (Hurst & Blackett, 1925), with a dedication to the American psychical researcher Hereward Carrington. 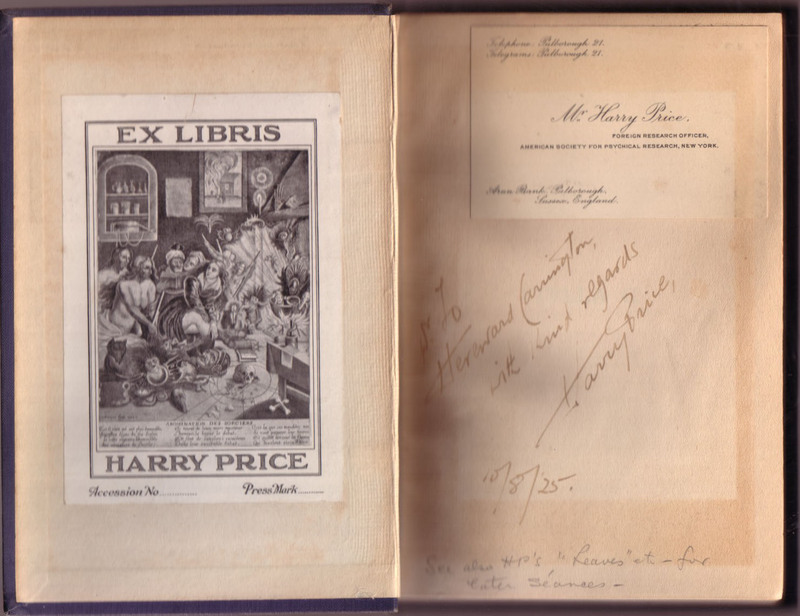 The copy contains Price's bookplate together with his calling card as Foreign Research Officer of the American Society for Psychical Research (10th August 1925). 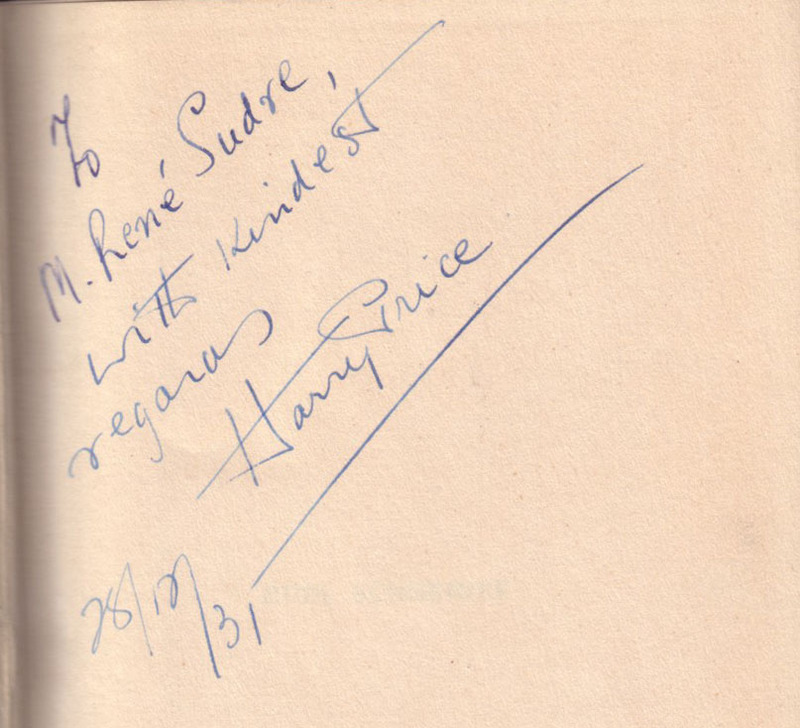 Copy of Price's Rudi Schneider - A Scientific Examination of his Mediumship (Methuen, 1930), with a dedication to fellow psychical researcher René Sudre (28th October 1931). 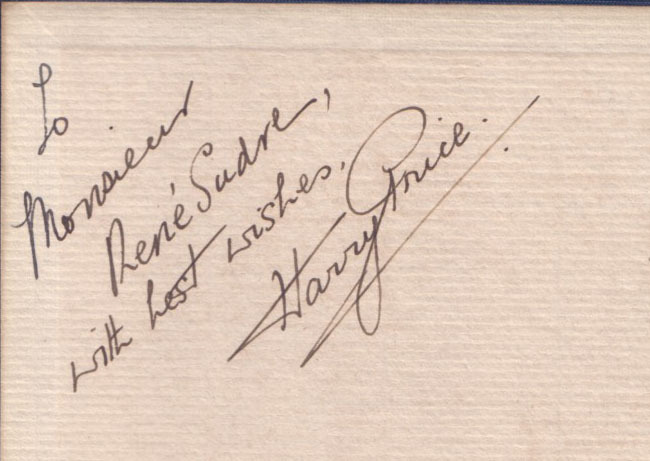 Copy of Price's Rudi Schneider - A Scientific Examination of his Mediumship (Methuen, 1930), with a dedication to the American magician Clinton Burgess. 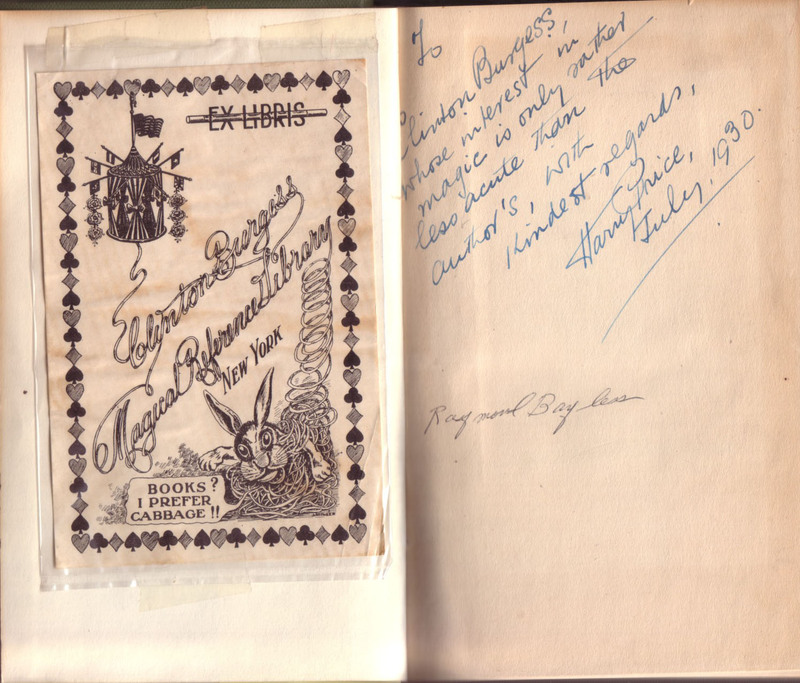 The copy contains Burgess's bookplate and was owned by the American psychical researcher Raymond Bayless (July 1930).